A suicide bomber killed eight people and wounded 13 on Wednesday in an attack on a bus carrying military personnel in the Afghan capital, Kabul, officials said. The explosion happened in the heavily secured downtown area near Kabul University at a time of increasing attacks by the Taliban and other insurgents around Afghanistan, where the outcome of a presidential election is still not known. 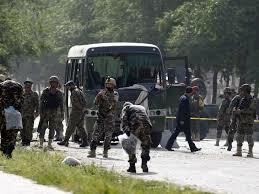 At least five of the dead were air force personnel, said Hashmat Stanekzai, a spokesperson for Kabul’s police chief. Stanekzai said the bus had been the bomber’s target. Heavy fighting is still underway in the strategically important Sangin district of southern Helmand province. Many Afghans fear overall security is deteriorating.